(2013). Determination of Potassium Sorbate and Sodium Benzoate in "Doogh" by HPLC and Comparison with Spectrophotometry. International Journal of Bio-Inorganic Hybrid Nanomaterials, 2(3), 429-435.
. "Determination of Potassium Sorbate and Sodium Benzoate in "Doogh" by HPLC and Comparison with Spectrophotometry". 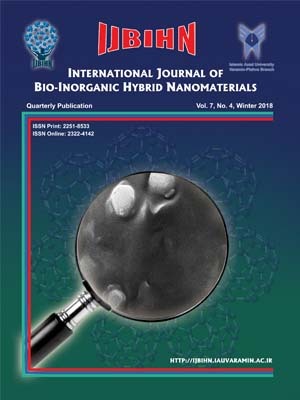 International Journal of Bio-Inorganic Hybrid Nanomaterials, 2, 3, 2013, 429-435. (2013). 'Determination of Potassium Sorbate and Sodium Benzoate in "Doogh" by HPLC and Comparison with Spectrophotometry', International Journal of Bio-Inorganic Hybrid Nanomaterials, 2(3), pp. 429-435. Determination of Potassium Sorbate and Sodium Benzoate in "Doogh" by HPLC and Comparison with Spectrophotometry. International Journal of Bio-Inorganic Hybrid Nanomaterials, 2013; 2(3): 429-435. There are various methods for the analysis of Potassium Sorbate and Sodium Benzoate in food products, but a rapid and reliable method for identification of these preservatives in Doogh (an Iranian traditional dairy drink) is a procedure, in which high performance liquid chromatography (HPLC) utilized and followed by UV diode array detection of the two preservatives. The aim of this case study was determination of Potassium Sorbate and Sodium Benzoate in Doogh, Samples consumed in the city of Tehran, Iran by HPLC in compare of Spectrophotometry method. In this study, 27 samples were analyzed. The HPLC determination of the preservatives was performed reversed-phase; C18 column and UV detected at 225 nm for sodium benzoate and 255 nm for potassium sorbate. In Spectrophotometry method, Sodium benzoate and Potassium sorbate were detected in 228 nm and 250 nm, respectively. The results of spectrophotometry in low concentrations, showed high values in comparison to what had been mention by HPLC. In high concentration, spectrophotometry showed the low value in comparison to HPLC. In conclusion, spectrophotometry could not detect and determine the Potassium sorbate and Sodium benzoate in a sample at the same time with reliable and exact results.